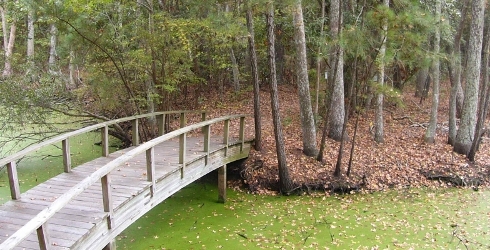 Hammocks—unique fertile areas along coastal regions characterized by hardwood vegetation and higher elevations than their surroundings—grew up along the shore of Roanoke Sound and are today protected as Nags Head Woods Ecological Preserve, a forest of beeches, oaks, hollies, pines, maples, sweet gum, and hickories located in Dare County. Some of the trees there are more than 300 years old. In addition to a well-developed maritime forest, the 1,092-acre ecological preserve has ancient dunes, freshwater ponds, and saltwater and freshwater marshes. Elevations in Nags Head Woods rise to heights of 60 feet. The ecologically diverse forest is home to more than 100 species of birds and 65 species of reptiles, amphibians, and mammals. Rare and endangered birds, including the Cooper's hawk, the swallow-tailed kite, the osprey, and the pileated woodpecker, can be found there. Various Native American tribes first explored this forest, hunting for game and gathering berries, nuts, and plants. Italian explorer Giovanni da Verrazano discovered the forest in 1524 and called it Arcadia. A small community of about 40 families was established there in the mid-1700s, but the settlers soon migrated to the beach side of the Outer Banks. During the eighteenth and nineteenth centuries, loggers cleared trees from the forest to build ships and, later, cottages. Faced with the threat of growing development in the early 1970s, the area was designated as a National Natural Landmark in 1974. With the help of the North Carolina Nature Conservancy, Nags Head Woods now encompasses more than 1,000 acres between Jockey's Ridge State Park and the Wright Brothers National Memorial. A visitors center on the site offers interpretive programs, guided canoe tours, and nature walks. North Carolina Wildlife Resources Commission, North Carolina Wild Places (1993). Image courtesy of the Nature Conservancy. Available from http://www.nature.org/ourinitiatives/regions/northamerica/unitedstates/northcarolina/placesweprotect/nags-head-woods-ecological-preserve.xml (accessed November 27, 2012).